The Case IH brand represents a tradition of leadership. It is the culmination of great agricultural equipment companies and brands, including J.I. Case, International Harvester, and David Brown, to name a few. Each of those has palyed an important role in the history and evolution of Case IH. Over the years, many things havr changed, but the legendary red brand will always represent a commitment to making agricultural products successful. 1831 Cyrus Hall McCormick invents the mechanical reaper. 1831 Cyrus Hall McCormick demonstrates his mechanical reaper at Steele's Tavern, Virginia. The reaper could cut 10 acres a day - as much as five men. He later added a self raking feature that allowed one man to cut 40 acres in a day. He does not patent the reaper until 1834. 1842 Jerome Increase Case establishes the Racine Threshing Machine Works in Racine, Wisconsin. 1848 Cyrus hall McCormick establishes McCormick Harvesting Company in Chicago, Illinois. 1851 McCormick's mechanical reaper earns a Gold Medal at the Royal Exposition at the Crystal Palace in London, England. McCormick enters the European market. 1863 Jerome Increase Case establishes J.I. Case and Company. He takes on three partners: Messena Erskine, Robert Barker and Stephen Bull. They become known as "The Big Four." 1869 J.I. Case and Company produces the first steam engine tractor. The Old No. 1 is on display at the Smithsonian Institution. The tractor is wheel mounted, but still drawn by horses and is used only for belt power. 1871 The Great Chicago Fire destroys the original McCormick factory. Case offered to build machines for McCormick, but McCormick refuses and builds a larger facility in southwest Chicago called McCormick Works. 1874 McCormick adds a mechanized steel binder to the harvester. He begins manufacturing for the 1877 harvest. 1876 Case builds the first self-propelled traction steam engine. However, Horses are still used to steer the engine. 1880 J.I. Case Threshing Company incorporates after "The Big Four" partnership dissolves. 1884 Jerome Increase Case makes a personal visit to a Minnesota farm with a faulty thresher that the farmer and local dealer were unable to fix. Cae attempts to repair the thresher himself. However, unable to repair it, he sets it ablaze and gives the farmer a new thresher. Case was disgusted that a faulty thresher came out of his factroy. 1886 Case becomes the largest worldwide manufacturer of steam engines. 1892 Case builds the first gasoline tractor, called the "Paterson Tractor." Case is the first of the old-line harvester companies to buiold a gas tractor. However, it was not successful and Case did not build another gas tractor until 1911. 1902 International Harvester Company is founded from Deering Harvester Company, Plano Manufacturing Company, the Champion Line and Milwaukee Harvester Company on July 28th, 1902. International Harvester represented 90% of the grain binder Business. The voting power controlled by Cyrus McCormick Jr., Charles Deering, George Perkins and J.P. Morgan, who arranged and financed the consolidation. 1905 The first International Harvester Company Friction Drive tractor made, using International Harvester's Famous stationary gas engine and a Morton chassis. 1910 International Harvester introduces the Titan tractor. The committee named the line "Titan" after the Greek mythological figure who was "of gigantic size and enormous strength." This was becoming the International Harvester tractor legacy: size and strength. 1911 Case releases the first gasoline tractor -- The 30-60. 1919 International Harvester develops first commercial PTO (power takeoff). 1923 Bert Benjamin builds first successful row crop tractor, the Farmall, and files for a patent the same year. It becomes known as the "Farmall Regular." The tractor had a revolutionary light design, but with a high power weight ratio, narrow front e=with a single guide wheel and precision steering for cultivation. It became a unified system of tractors and matching implements for plowing, cultivation and harvesting. 1936 UAW Local 180 is founded on September 23rd, 1936. 1936 Harvester Red #50 is adopted for all International Harvester tractors, crawlers and power units on November 1st, 1936. 1939 International Harvester introduces the second generation Farmall - the Letter Series - on August 8th, 1939. The series included A and B (small-sized), H (middle-sized), and M (large-sized) tractors. 1943 International Harvester builds first successful spindle cotton picker. "old Red" was mounted on a Farmall Tractor H. Both are donated for display at the Smithsonian Institution. 1954 The new Number Series Farmall in production, replacing the Letter Series. 1958 John Steiger and sons Douglas and Maurice build the first Steiger tractor in their barn at Red Lake Falls, Minnesota, during the winter of 1957-58. the family needed a tractor with high horsepower than what was commercially available. The tractor, weighing in at 15,000 pounds, is used in the Steiger's farming operation for 10 years. 1958 Loren Tyler founds Tyler Manufacturing and produces pull type dry spreaders and anhydrous applicators. 1962 International Harvester introduces Farmall and International 706 and 806 models with a new design with more horsepower and long-term reliability. 1963 Case has 125 distributorships with subsidiaries in United Kingdom, France, South Africa, Brazil and Australia, with 15 licensees in other countries. Twenty percent of U.S. production is shipped overseas. 1963 The Steiger family decides to begin commercial tractor production, with Douglas Steiger serving as chief designer and Maurice Steiger heading up production. Five units are designed and built in the family's barn and sold commercially. Steiger brand tractors are painted a distinctive light green. 1965 International Harvester introduces the Frmall and International 1206. It is the industry's first row crop tractor with more than 100 horsepower. 1969 Case's Old Abe logo is replaced by a new, more modern logo. 1971 International Harvester launches the International Farmall 66 series, powered with a new V-8 engine. 1974 Case's Agricultural Equipment Division changes colors to Power Red and Power White from Flambeau Red and Desert Sand, which had been used since 1954. 1977 International Harvester introduces the axail-flow rotary harvesting concept, with its 1440 and 1460 model combines. Axail-Flow technology improved threshing and grain quality and used fewer parts for easy maintenance. The company spent $56 million and one million man-hours to design, build and test the concept. Eventualyy every other major equipment manufacturer developed some version of the rotary combine design pioneered by International Harvester. 1980 International Harvester produces the innovative 2+2 row crop articulated tractor, with the driver seated on the rear half of the tractor. 1982 The Steiger Panther 2000 tractor is introduced. It is the fiest model to have a 12-speed full powershift transmission, electronic controls, comfortable deluxe cab and PFC hydraulics. 1983 Case changes the color of 94 series tractors to black and white. Government regulations banned lead paint and all red and yellow paint contained lead. 1984 Case introduces a new line of 94 series 4WD tractors, including the most powerful unit the company has ever produced, the 4994. The Model 4994 features a turbocharged V-8 with manufacturer's rating of 400 gross engine horsepower. 1985 U.S. Justice Department approves Case's acquisition of International Harvester. The new organization -- Case IH -- becomes the second largest farm equipment manufacturer. The combination provides increased market share, a broadened prodcut line and a greatly expanded dealer organization. 1986 Steiger Tractor Incorporated files for Chapter 11 - bankruptcy protection due to the struggling worldwide farm economy. With the Steiger plant operating at 25 percent capacity, Tenneco Inc. -- then the parent company of the Case IH -- buys Steiger. 1988 Case IH introduces the Magnum tractor - the first all-new machine to come from the combined engineering of International Harvester and Case. 1988 The first red 9100 series Case IH Steiger tractors are produced. Case continues to produce green Steiger tractors until 1989. 1988 Fortune magazine names Case IH combines, planters and loader/backhoes among the best products built in the U.S.
1995 Case IH offers Advanced Farming System (AFS). The state-of-the-art precision farming system allows farmers to monitor yields with satellite technology to maximize productivity. 1996 Case IH acquires controling interest in Steyr Landmaschinentechnik GmbH of St. Valentin, Austria a manufacturer of tractors specially designed for mountainous agricultural regions. 1996 Steiger Quadtrac tractor is introduced. The 360-horsepower vehicle has four separate tracks that work independently to provide a greater level of ground contact. The new design reduces ground compaction and provides more traction and less slippage. 1997 40,000th Steiger tractor is produced. 1998 Case IH expands its presence in the application equipment market with purchase of Tyler Manufacturing. 1998 Business Week magazine names the Case IH MX series Magnum tractor new product of the year, in it's 10th anniversary year. 2000 The MX270 sets new row crop tractor records at the University of Nebraska Test Laboratory. 2003 The company announces the return of the Farmall brand name with introduction of the new D and DX series tractors. 2003 The 100,000th Magnum tractor rolls of the line in Racine, Wisconsin. 2003 Deputy Prime Minister of the Russian Federation and Minister of Agriculture Alexi Gordeyev, along with a delegation of other Russian dignitaries visit Case IH headquarters in Racine, WI to discuss future business opportunities. 2005 STX500 Steiger Quadtrac tractor shatters the World Plowing record, turning 792 acres )321 hectacres) of farmland in just 24 hours. 2006 Ferrari team cars feature prominent Case IH decals during the Grand Prix of Canada in Montreal, June 25, 2006; and the U.S. Grand Prix in Indianapolis, July 2, 2006. 2006 Case IH announces new on-board module builder technology for cotton harvesting. The Case IH Module Express 625 is the first commercial cotton picker with the ability to build modules while harvesting, saving time, labor and capital. 2007 in every country, Case IH equipment is approved to use five percent (B5) of an approved biodiesel fuel with the same performance as regular fuel. Following proper maintenance and fuel requirements, use 20 percent biodiesel blends (B20) are approved in more than 90 percent of the models sold in Europe and North America. And, nearly half of the models sold globally, including the flagship Axial-Flow 8010 combine are approved, following proper protocols, for 100 percent biodiesel (B100). 2008 Case IH introduces Gold Signature Edirion models to celebrate the 50th anniversary of Steiger and the 20th anniversary og Magnum tractors. The limited edition models carry special decals that are personally signed by Randy Baker, Case IH president. 2008 Farmall tractors celebrate 85th anniversary with the introduction of more than 30 models. 2009 Case IH brings to market the broadest line of combines in the industry with six Axial-Flow models, including a Class IX 9120 model. 2009 Case IH expands its Magnum line with three new models built in Racine. 2009 Case IH launches continuously variable transmission (CVT) technology on tractors. The CVT automatically adjusts to constantly deliver the best possible balance of power and fuel efficiency at field speeds. 2010 Case IH ships world's first tractor meeting new the U.S. Environmental Protection Agency's (EPA) Tier 4 Interim/European Union Stage III emissions requirements for agricultural equipment. The engine in the new Magnum Series tractor uses Selective Catalytic Reduction (SCR) to reduce particulate matter and nitrogen oxides in emissions while actually boosting power, and improving fuel efficiency and durability. 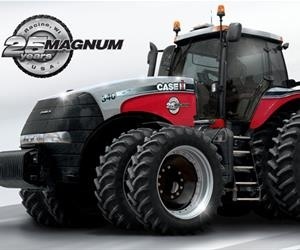 2012 Case IH celebrates 25 years of the Magnum tractor. 2013 Case IH celebrates the 90 year anniversary of the introduction of the Farmall tractor, and the change in agriculture industry that resulted from it. 2013 Case IH introduces the first two-row sugarcane harvester with variable row-spacing, offering huge advantages in flexibility and harvesting speed. 2014 The Case IH Steiger tractor is voted “Machine of the Year XXL 2014” at Agritechnica in Hanover, Germany. 2015 The Case IH Magnum tractor is voted 2015 Tractor of the Year, and the Magnum Rowtrac is introduced.